The U.S.S Enterprise monitors a star with unusual properties, when it encounters a distress call from a malfunctioning freighter called the Sanction. The freighter is from the planet Ornara, and its confused captain T’Jon (Merritt Buttrick), has no idea how to repair the ship. Nor does his crew. When the ship nears destruction, Captain Picard (Patrick Stewart) attempts to beam its crew to the Enterprise. The Ornarans, however, beam over cargo, instead, as well as two survivors, T’Jon and Romas (Richard Lineback). Also recovered before the freighter’s explosion are two Brekkians: Sobi (Judson Scott), and Langor (Kimberly Farr). 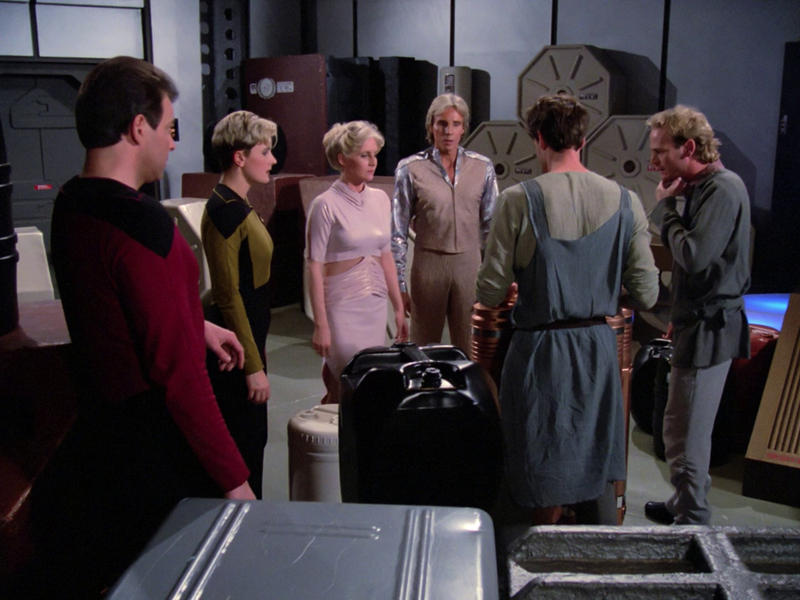 Almost immediately, the two factions begin arguing over possession of the cargo, a medicine called Felicium. The Ornarans are suffering from a deadly plague, and the Felicium is the only cure. 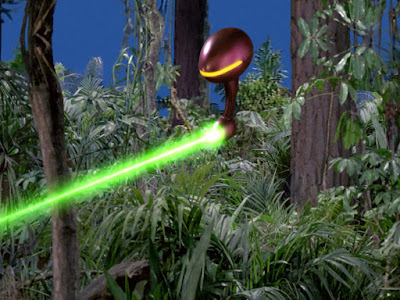 The Brekkians are the only people with the ability to make the cure, because it grows on their planet. Each side claims the cargo belongs to it. As Captain Picard investigates with Dr. Crusher (Gates McFadden), he learns that Felicium is actually a narcotic, and the Ornarans are all addicted to it. The plague was cured years earlier. The Brekkians, however, have not informed them of this situation. Dr. Crusher wants to tell the Ornarans the truth, since they have been victimized, but Captain Picard realizes it would be a violation of the Prime Directive to interfere. Instead, he must find another way to help the Ornarans. 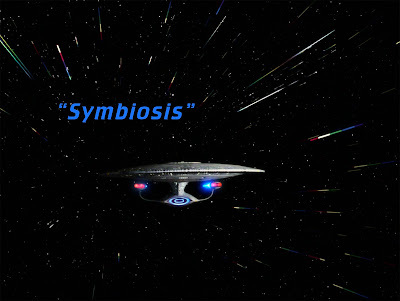 “Symbiosis” is famous as the “very special” episode of Star Trek: The Next Generation (1987-1994), or the “just say no to drugs” episode. Both of these descriptors are reductive, and don’t get at the actual quality of the episode itself. Certainly, there is one scene that could be omitted from the episode, involving Tasha Yar’s (Denise Crosby) “just say no” speech to Wesley Crusher (Wil Wheaton). 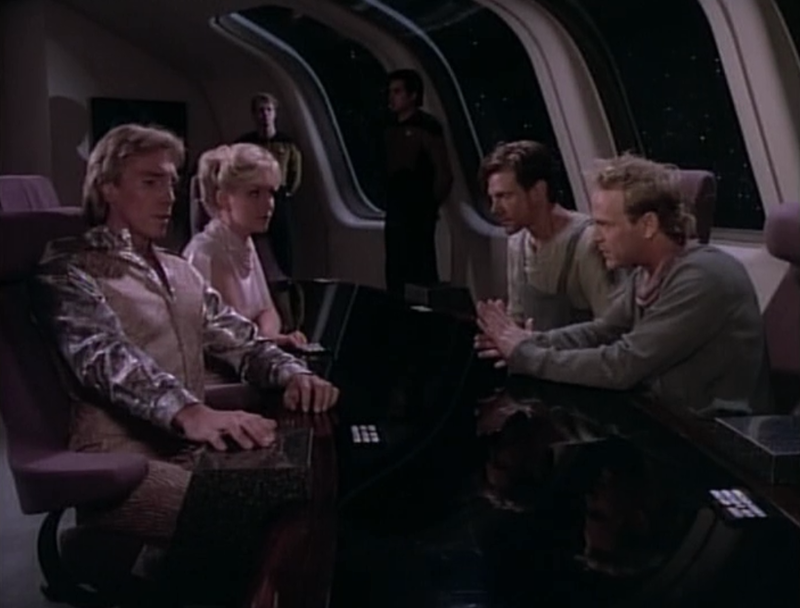 The rest of the episode is strong, however, as it involves Captain Picard having to arbitrate a heart-breaking, and at times, infuriating conflict between two sovereign societies. The problem with the “Just Say No” speech is not its existence, or even “social commentary” purpose about drugs, and drug addiction. Rather, it is the character perspective of the speech in question. One of the key problems for Star Trek: The Next Generation is that the “perfect” people of the Enterprise get to (sometimes smugly…) lecture to life-forms who are outside the Federation, and don’t live in a veritable paradise. Here, Tasha explains to Wesley the drug addiction she witnessed on the failed colony she hails from (seen in the fourth season story “Legacy.”) Tasha lectures Wesley about drugs from that perspective, but importantly, it is still from a superior, and abstract point of view. By contrast, this scene would have possessed real power -- and value -- had Tasha explained to Wesley that she lived with drug addiction before being rescued. That the adults she lived with, the parents who abandoned her, what-have-you, were drug addicts, whose behavior had deleterious impact on not only their lives, but hers. Better yet, she could have acknowledged that, on the colony, she was a drug user, before her life changed. Either of these revelations would have built Tasha’s character in a meaningful way, and made the point that no one sets out to make bad decisions, or become an addict. The speech would have also suggested that drug addiction doesn't have to be the end. It can be overcome. But as delivered, Tasha’s speech is just a smug lecture from someone who has the luxury of living in a perfect world, and doesn’t understand want, need, hunger, or the desire to escape from a bad situation. In short, the speech becomes a message, instead of a philosophy that seems to come organically from Tasha's character. 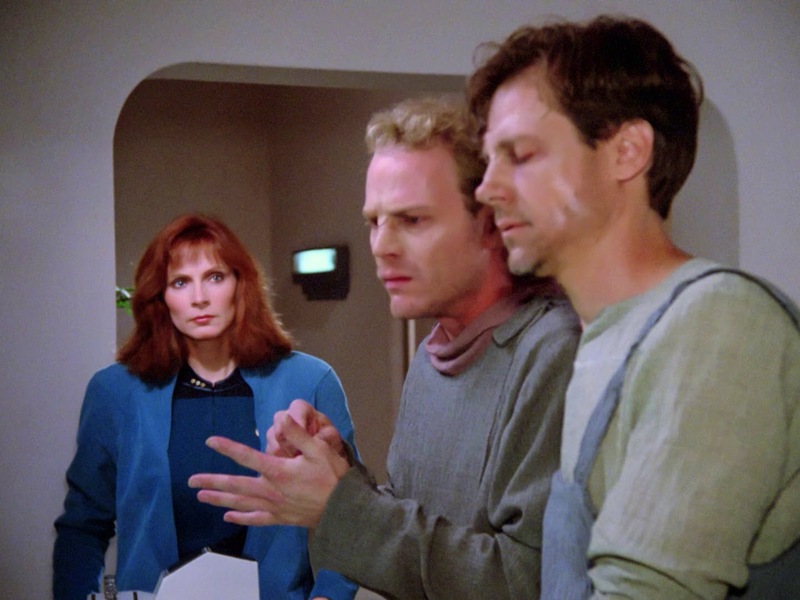 Now I’ll go out on a limb and state that, in spite of the on-the-nose drug lecture, “Symbiosis” is nonetheless one of the more powerful and effective episodes of TNG’s first season. In The Original Series, The Prime Directive is always brought up right before Kirk chooses, for various reasons, to break or bend the rule. What we don’t typically see in The Original Series, is the rule being followed, or observed. So “Symbiosis” is that rare stand out: a story in which the wisdom of the Prime Directive is debated and, ultimately, upheld. Crusher doesn’t like it being upheld, because she is coming from a humanitarian point of view. She wants to stop the suffering and exploitation of the Ornarans. Picard takes a broader view and realizes it is not her place, or Starfleet’s, to decide what should or should not happen in another culture. He is still able to help the Ornarans, in the grand scheme of things, by denying them the coils that will repair their ships. This means that there will be no further shipments of Felicium, and, after withdrawal, the addiction of the people will end. They will have to suffer, but Picard sees that suffering, no doubt, as something that should not be alleviated. It is an outgrowth of Ornaran and Brekkian choices, and so the two civilizations must contend with it. From that suffering will come growth, and change. And who is Picard, or Crusher, to deny the people that change? Although it does not concern Picard’s background, history, family, romances or other details, “Symbiosis” is actually an incredibly powerful story for the Captain. He must balance so many factors here, and demonstrate wisdom in his handling of the problem.He must rationally reason out the conflict, and determine how best to keep his oath to obey the Prime Directive, and correct a wrong. His answer is elegant, even if, as Crusher notes, it won’t put an easy end to the Ornaran addiction. There are no phaser battles, new planets to explore, or very memorable aliens featured in “Symbiosis.” Instead, this is a portrait of a captain grappling with his morality, and the rules that he claims to cherish and live by. We see Picard agonize over this, and more than that, live with the ambiguity that he may never know if he made the right choice, or the wrong one, for these people. He does his best in the moment, even if Crusher disagrees with him. But Picard demonstrates why he deserves to sit in the Captain’s chair of the starship Enterprise. 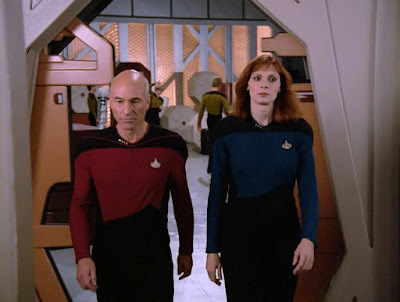 I have written at length here about how the writing of the first season of Star Trek: The Next Generation did Captain Picard no favors. We’ve seen him surrender the Enterprise twice in four episodes ("Encounter at Farpoint," "The Last Outpost.") We’ve seen him go mad and lose his mental faculties in several episodes (“The Naked Now,” “Lonely Among Us,” “The Battle,” etc.). Even though people hate “Symbiosis” for the condescending, smug “just say no” drug speech, there is room to love this installment as a portrait of a captain forced to reckon with the philosophy he has chosen to live by. 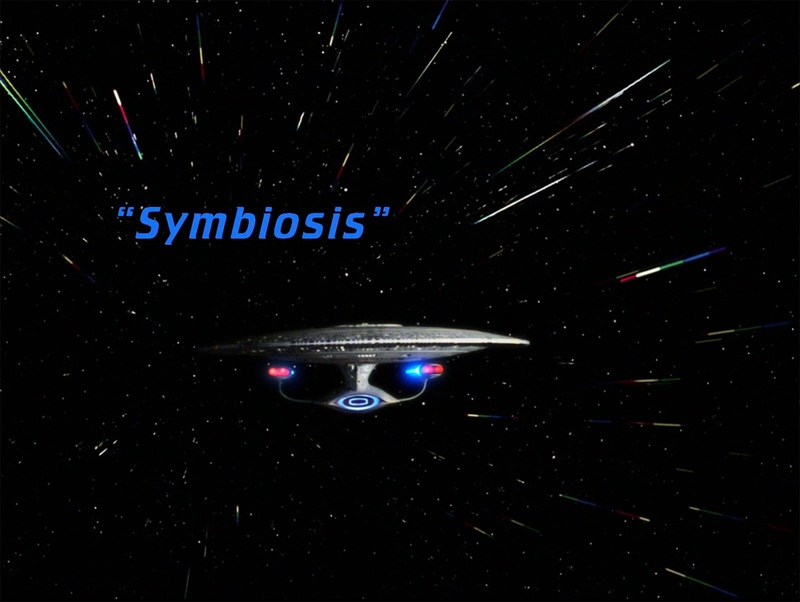 "Symbiosis" is one of my favorite episodes of The Next Generation. Sure it has a pandering speech about drug use; sure it rips off elements of The Original Series episode "Let That Be Your Last Battlefield." 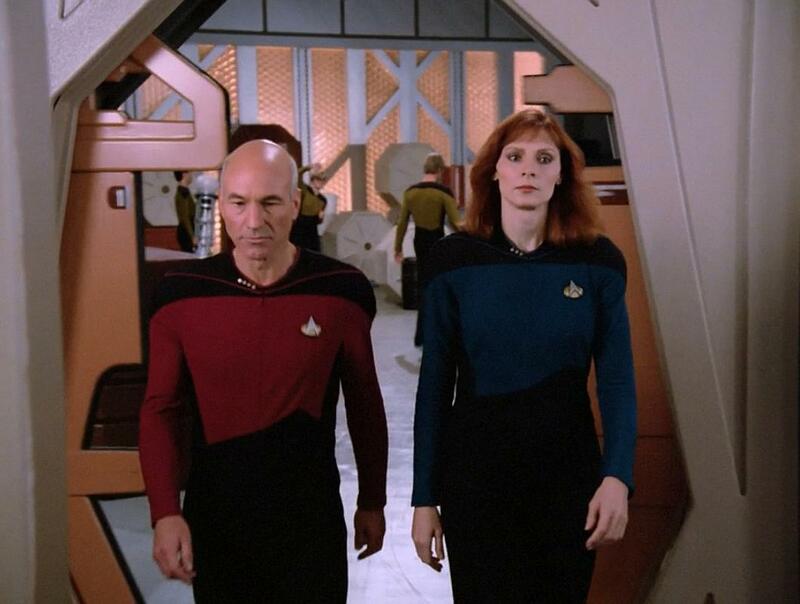 However, when Captain Picard stops the turbolift to explain to Dr. Crusher that "The Prime Directive is not just a set of rules...it is a philosophy," the show became Star Trek in that moment. I remember watching and feeling that the series had turned a corner with this scene, and no other actor, or Captain, could have delivered such an eloquent speech as Patrick Stewart's Picard gave in the closing moments of this episode. Notable is also the performance of Merritt Butrick, who we all remembered as Kirk's son in Star Trek 2: The Wrath of Khan. T'Jon was one of his final roles before he died, far too young, from AIDS-related complications. In hindsight, one truly gets the impression that he knew his condition was worsening in his actual life, and channeled his emotions into this performance. It is poignant and affecting, and quite beautiful. Gene Roddenberry was interviewed about this episode and reflected that drugs were a poor substitute for happiness, an attempt to replace unhappiness with a substance that could never truly provide it. Although he did not write this episode, there are echoes of his sentiments throughout. The message still resounds. Finally, in a blink and you'll miss it moment, Tasha Yar waves goodbye to the camera in the cargo bay. "Symbiosis," as it turns out, was filmed after "Skin of Evil," and the cargo bay scene was the last Star Trek scene the actress filmed (until "Yesterday's Enterprise" years later). She snuck in a little wave, and nobody caught it, and it remains in the episode to this day. I appreciate your thoughtful review, John. This episode would definitely be a contender for my top 20 TNG list.